Like others, I've long had the fantasy of being a disc jockey. As a DJ, I would share favorite music with listeners, introducing songs and artists with the occasional anecdote or bit of trivia only I might know. "Have you heard this rare recording by ...?" or "Did you know that this singer also performed on ...?" As a DJ, I imagined the pleasure others might take in hearing a performer or recording they, like me, especially enjoyed. In 2002, I was able to turn my fantasy into reality thanks to Live365.com, the streaming radio service provider. A pioneer in the field since 1999, Live365 enables individuals like me the chance to program music which plays over the internet. It was simple. I paid a small annual fee, around $120.00, to cover music licensing fees and other costs associated with streaming content over the web. But now, it's all over. Recently, Live365 announced that as of January 31, 2016 it will cease operations. As I understand it, it's shutting down is largely a result of actions by the Copyright Royalty Board, which raised rates for net broadcasters while special lower rates for smaller broadcasters (like me) were phased out. With the writing on the wall, Live365 laid off staff and investors pulled out. As radio news sites have reported, the loss of Live365 is a tremendous blow to the diversity of internet radio--diversity made possible by thousands of niche broadcasters running their stations more as hobbies than businesses. I was one of those hobbyists. And the station I created was called RadioLulu. It was named after Lulu, the character played by Louise Brooks in the 1929 silent film, Pandora's Box. RadioLulu plays Louise Brooks inspired and silent film themed music of the Twenties, Thirties and today. I think it is unique. The station features rare recordings by early film stars (who knew Rudolph Valentino or Charlie Chaplin cut records? ), as well as theme songs from silent films ("silent films were never silent"), early show tunes, dance bands, Jazz Age jazz, European rarities, novelty numbers, and more. There are hotel orchestras, crooners, torch singers and even a bit of contemporary rock and pop, the latter mostly tributes to Brooks by the likes of Orchestral Manoeuvers in the Dark (OMD), Natalie Merchant, Rufus Wainwright, and even avant-jazz instrumentalist John Zorn. RadioLulu is a place where I was able to share my audio collection with others. Here, fans could hear all manner of rare recordings by Brooks' co-stars (Adolphe Menjou, Frank Fay, Joan Blondell, etc...) as well as her contemporaries (Clara Bow, Gloria Swanson, Joan Crawford, Jean Harlow, Barbara Stanwyck and others). RadioLulu also features music from five of Brooks' films -- including the haunting themes from Beggars of Life (1928) and Prix de Beauté (1930), as well as fan favorites like Maurice Chevalier's "Louise." To give the music context, I added tracks from the times. Janet Gaynor and Charles Farrell can be heard singing the poignant 1929 hit, "If I Had a Talking Picture of You," one of a number of movie-related numbers on RadioLulu. There are also numbers like "Hooray for Hollywood," "Take Your Girlie to the Movies," and "At the Moving Picture Ball," as well their downbeat flip-side, like Constance Bennett's rendition of "Boulevard of Broken Dreams," and the Alice White & Blanche Sweet number "There's A Tear for Every Smile in Hollywood" (from the soundtrack to Showgirl in Hollywood). Along with spoken word intros and miscellaneous snippets of dialogue, RadioLulu even featured regulations explaining proper radio station identification given by none other than by Cary Grant, co-star of the 1937 romantic musical, When You're in Love (in which Brooks had an uncredited role). Grace Moore, Grant's co-star, is also featured. It would be hard to list all the odd, interesting, and notable recordings on RadioLulu. Among the 432 tracks and nearly 23 hours of programming, I also included a few rare vintage songs about movie stars--Charlie Chaplin, Greta Garbo, Buster Keaton, Zasu Pitts, and Mickey Maus among them. I am especially proud of having tracked down four different vintage recordings of the haunting theme from Brooks' only French film, Prix de Beauté. She didn't sing it--her role in this early talkie was dubbed; but who did has long been a matter of debate among fans. Some have even suggested Edith Piaf, but she isn't it. My four different vintage recordings solve the mystery. Each can be heard on RadioLulu along with the 2006 cover version they inspired, "Chanson pour Louise Brooks," by the French group Les Primitifs Du Futur, featuring the famed cartoonist Robert Crumb on mandolin. My obsession with tracking down little known related recordings has even led to a discovery or two. One such discovery was figuring out who the jazz combo is seen playing at the wedding party in Pandora's Box. It turns out they were Sid Kay's Fellows, a popular dance band in Berlin in the late 1920s and early 1930s. They accompanied Sidney Bechet during his concerts in the German capitol, and during their heyday, released a number of 78 rpm recordings. When the Nazis came to power in 1933, the group-which included Jewish musicians--were forbidden to perform publicly. I managed to track down some of their early recordings, and today Sid Kay's Fellows can be heard once again on RadioLulu. I also tracked down the musical group seen in Brooks' other great G.W. Pabst directed film, Diary of a Lost Girl (1929). That small combo was lead by the Spanish-born musician Juan Llossas, who would soon find fame for his Tangos. Did you know the Tango was once all the rage in Weimar Germany? RadioLulu features a few such recordings. One RadioLulu track I especially like is Marek Weber's "A media luz." A scene from Pandora's Box, featuring Syd Kay's Fellows.Image courtesy of Louise Brooks Society. RadioLulu also features an unusual recording by Jaroslav Jezek, the "George Gershwin of Czechoslovakia." In 1929, the year that Brooks played Lulu in Pandora's Box and was suddenly famous all over Europe, Jezek wrote and recorded "Zasu," a memorable song whose sheet music depicts the actress! Coincidence? Not likely. And speaking of Gershwin, my station also features a handful of songs penned by Gershwin, with whom Brooks had a flirtatious acquaintanceship. By the way, Brooks' favorite Gershwin song, "Somebody Love Me," can be heard on RadioLulu. Though I hoped for acclaim, I knew would never reach a mass audience. Nevertheless, I love programming RadioLulu. It's the few listeners I reach that I aim to please. According to my monthly listener reports, at any one time dozens and sometimes even hundreds of individuals from around the world tune into RadioLulu. Over the years, a few thousand individuals have "liked" the station. Occasionally, I do receive an email or a listener posted comment praising the station and saying how much they loved the Roaring Twenties or early jazz or old movies. On New Year's Eve, a woman named Theresa emailed. She wrote, "Wish I had discovered you earlier. Best station I've ever heard for old, unique style music of the 20's and 30's. Love hearing people I have only heard of but never actually heard like Josephine Baker, Ruth Etting, and so many movie stars not known for singing. So fabulous! Will you be able to keep going with licensing changes? This music and your station is a treasure." That made me feel good. 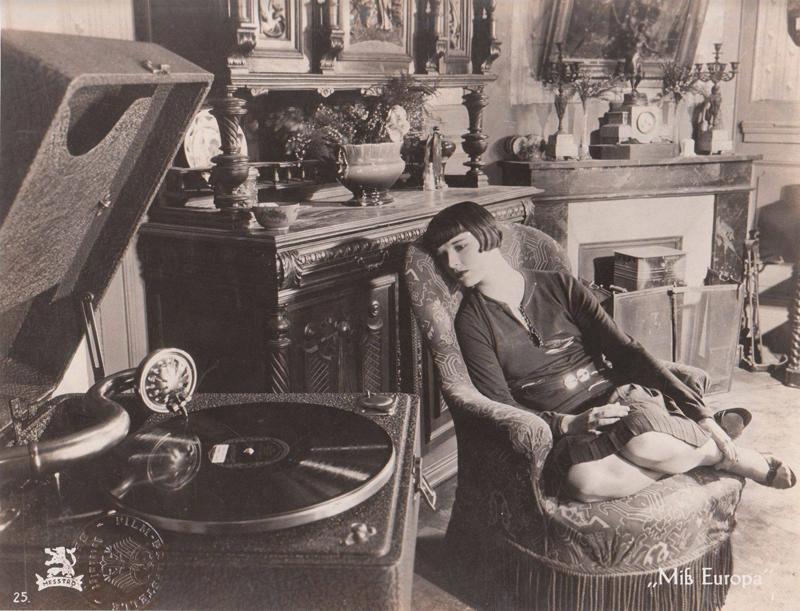 And so did film critic Leonard Maltin, who wrote a short piece about the Louise Brooks Society and pointed out my website even had its own radio station "that allows you to listen to music of the 1920s. Wow!" Sometimes, recognition has come from unlikely places. There is a contemporary Spanish group named Rädio Lulú who play swing and retro pop music and may have even taken their name from my station. And sometimes, recognition comes from unlikely sources. A few years ago, I had the chance to meet the English actor Paul McGann, who starred in With Nail and I and played the eighth Doctor Who. Like me, he too is a devotee of early film. When we met, McGann had a quizzical look on his face before saying, "You're the guy that does RadioLulu. It's incredible. I listen all the time." The Pulitzer-Prize winning graphic novelist Art Spiegelman has told me he tunes-in, as has the award-winning science fiction writer Richard Kadrey. Last November, I received an email from a listener named Nick. He is employed at the Vito Russo Library at the Gay Center in New York City; he wrote to say that RadioLulu is played at the library every Saturday, and that "Everybody loves it." That was gratifying as well. And that is why since 2002 I have pursued this labor of love called RadioLulu. There is a lot of great music on Live365, as well as a lot of passion behind its many stations. I will miss the niche stations like mine and like those that play only Tiki music. I will miss the chance to discover new music. I will miss the opportunity to listen to favorites like Radio Dismuke< (an amazing station featuring popular music of the 1920s & 1930s), Radiola! (another station featuring popular music of the 1920s & 1930s "guaranteed to wake up the mind and make it smile"), and Weimar Rundfunk (European Dance Orchestras and Hot Dance Bands). Each are longtime broadcasters. I am sure each will find a new home, if they haven't already. 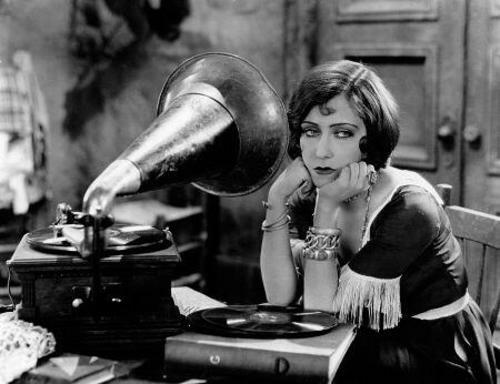 Gloria Swanson contemplates which record to play next.Image courtesy of RadioLulu. There is a lot of great music on RadioLulu. Along with such famous names as Bing Crosby, Rudy Vallee, Benny Goodman, Tallulah Bankhead, Django Rheinhart, and Fred Astaire, there are as many less well known but just as deserving artists like the Eskimo Pie Orchestra, Scrappy Lambert, Hanka Ordonówna, Annette Hanshaw, Lee Wiley, Kiki of Montparnasse (Man Ray's muse), and Sidney Torch (the great British cinema organist). There is even a 1929 recording of the German dramatist Bertolt Brecht singing "Mack the Knife." In 1940, Brooks self-published a now extremely rare booklet titled Fundamentals of Good Ballroom Dancing. I have a copy, and in it, the actress turned dancer recommended a few recordings with which to practice one's steps. I tracked down those recordings, and that's why you'll hear Xavier Cugat's "Siboney" and Wayne King's "I'm Forever Blowing Bubbles." Here are some tracks you won't want to miss: "You Oughta be In Pictures" by Little Jack Little & His Orchestra, "Makin' Whoopee" by B.A. Rolfe & His Lucky Strike Orchestra, "Puttin on the Ritz" by Harry Richman, "The Vamp" by the Waldorf-Astoria Dance Orchestra, "Flapperette" by Nate Shilkret, and "I'm a Jazz Vampire" by Marion Harris. Oh, and don't miss "Lulu" by Twiggy (the 1960's supermodel). It is one of a couple dozen songs with "Lulu" or "LouLou" in the title. I am not sure what will happen with RadioLulu. I am looking around for new streaming sites. I hope to continue sharing my collection of Louise Brooks inspired and silent film themed music with the world. How can I not? Thomas Gladysz is an arts and entertainment writer. He is also the founding director of the Louise Brooks Society, an online archive and international fan club launched online in 1995. Recently, he contributed the audio commentary to the newly released Louise Brooks film Diary of a Lost Girl from Kino Lorber.